This countertop bakery display case has three shelves and two doors in the rear of the case with handles on both acrylic doors. The acrylic trays are removable and are included. This case is twenty-two inches deep, allowing you to display 4-6 rows of cupcakes depending on their size. This service counter display is a must have for your bakery or breakfast bar. This Service Counter Display offers a faultless way to display your products. 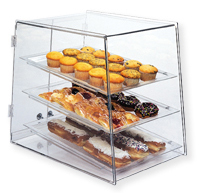 Made of clear Acrylic, this Countertop Pastry Display, Food Display is built to last. Buy Service Counter Display now - Use our convenient shopping cart or give us a call and place your order with a knowledgeable service representative today!